The Car Doctor in Palo Alto & Mountain View provides exceptional auto repair services backed by the industry's leading warranty. Our auto doctors 'diagnose correctly and cure with care' all makes and models of cars, trucks and SUVs, from simple brake pad replacements to complex engine rebuilds. Our ASE-certified auto technicians are highly trained and experienced, performing precision diagnostics and expert auto repair on complex new vehicles as well as simpler, older models. 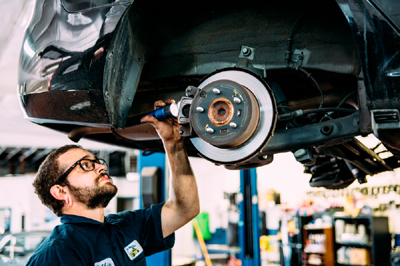 As a NAPA Auto Service Center, we provide our customers with a 24-month or 24,000-mile warranty honored by thousands of trustworthy shops across the nation. This exceptional warranty covers you no matter where your travels take you, and is just one of the ways we ensure peace of mind for our customers. The Car Doctor is a preferred alternative to the high costs of dealership service departments, offering unmatched customer service, quick and accurate diagnostics, and comprehensive auto repair. And your new vehicle warranty is safe with us. But don't take it from us; read any of our 100+ 5-star reviews on Yelp and other places online to learn why our customers are happy and like to refer friends and family! For your next auto repair in Mountain View, call The Car Doctor at (650) 492-6853. We're changing public opinion of the auto repair industry one customer at a time by delivering exceptional results, caring customer service, and backing all repairs with an industry-leading 24-month or 24,000-mile warranty. Discover the difference for yourself. Call The Car Doctor at (650) 492-6853 today for guaranteed auto repair in Palo Alto, Mountain View and Sunnyvale! "Fast and friendly service! I love this place, and am so happy I discovered brothers Chris and Gary. Going to an auto repair shop can be intimidating for someone like me who knows nothing about cars, but these guys not only know their stuff, they're super friendly and actually take the time to explain the situation. There's no run-around and no awkwardness. I brought my car here for a brake replacement, and I couldn't be happier. Not only did my brakes get replaced quickly, but their prices are more than fair. And there's no overcharging or up-selling like some shops. From now on, when my Sally needs something remedied, I'll be taking her to The Car Doctor!"